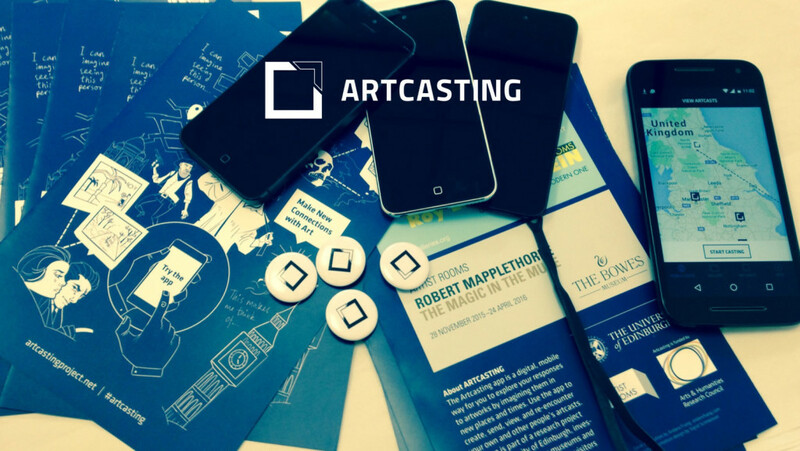 Artcasting was an AHRC-funded interdisciplinary project which took place over 14 months, from May 2015-June 2016. It brought together expertise in digital education and learning, arts evaluation, and design informatics, and was conducted in partnership with ARTIST ROOMS, National Galleries of Scotland and Tate. The project involved the design, development, piloting and analysis of an Artcasting methodology and a digital output in the form of a mobile app. The mobile app invited visitors to select an artwork and create an ‘artcast’ by choosing and describing a new location and time for the artwork; visitors could then encounter or re-encounter artcasts in those locations at a later date. The Artcasting approach generated and measured links and relationships between objects, places and people – simultaneously creating connections and evaluating the intensity of engagement with artworks and exhibitions. The executive summary and report linked below describe the project’s objectives, activities and findings, and point the way to future research and development possibilities.